I’m sick and tired of the gloomy credit-crunch depression that is threatening to strangle the life out of our bright and creative nation.Sure rising unemployment, falling house prices and mounting personal debt isn’t something to be laughed it. But people should stop looking at the current economic conditions with a heavy heart and view at it as a great chance to make a success of themselves. I’ve always had the entrepreneurial spirit in me. As a school kid I used to sell Panini football stickers to my classmates and also worked in my father’s newsagent store in Alloa. As a law student at Strathclyde University I raised cash by organising campus events. Even after graduating I walked out of my law traineeship after an hour and decided I was going to work for myself and create my own destiny. So you have to believe that there are real opportunities out there if you have a good idea and are prepared to put in the hard work required to make a success of your business. As an entrepreneur and venture capitalist I have been astounded by the level of dynamism and innovation shown by young Scots throughout the past twelve months. I recently met and advised a young Napier University student Michael Ridd. Michael was inspired by family members who found bus journeys with a pushchair difficult and created The Baby Board, which folds completely flat for travelling. Michael didn’t try 10,000 buggy designs, but crucially done his market research, which can be as simple as going down to your local supermarket and asking 100 people what they think of your product. He has recently applied for a patent for his invention and once he secures this he will be in a position to negotiate commercial supply and distribution agreements with UK retailers. I continue to come across genuine world-class talent in my role as a business mentor and I am excited about working closely with a number of young entrepreneurs as they aim take their business to the next level. One in particular is Camille Lorigo, a Glasgow based fashion designer. Camille is the founder of Glasgow fashion emporium Che Camille where she mentors and showcases Scotland’s most talented young designers. 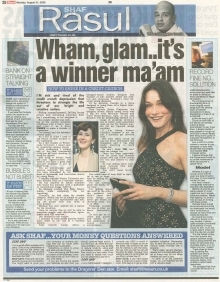 I’ll be advising Camille in a move designed to bring a higher international profile for the cream of Scotland’s young designers, including Helen Finlayson, the Fort William born designer whose Harris tweed wrap was a big hit with Michelle Obama and Carla Bruni-Sarkozy at the G20 Summit. A key element of the link-up will be to introduce Camille to a range of potential investors in the coming months, one of which could potentially open up the Far Eastern market for her talented design portfolio. If I’m being honest Camille’s business is not the sort I normally get involved with. But what really struck me about Camille was her drive, enthusiasm and dynamism and it has been really inspiring to work beside her. You may be reading this thinking that you can’t possibly take the plunge, blaming a lack of capital or being crippled by the fear of losing your regular monthly pay packet. But there are huge opportunities for gutsy and dynamic people who can think outside the box and believe in their risks. So stop talking and talking about your great business idea and take that jump off the top diving board and make it happen. You don’t need that much cash. You could have at least £500 in capital in two to three days by selling off some assets. I’m not talking about the family silver here, I’m talking about the stuff in the attic, the presents you didn’t want and other things you never got round to throwing away. Even stuff you regard as old tat such as an action man figure or a scalextric set has a value. Using eBay is a great way to off-load second-hand goods and raise much-needed tax-free seed capital for your new business. Lack of capital is a lousy excuse for not starting your own business. Sit down and work out how much you need and how to get it. I’m also sick of hearing that the internet has peaked, the e-commerce bubble has burst - absolute nonsense as far as I’m concerned. The internet is still relatively young, creative and dynamic and offers a great platform to establish a dedicated online business or to expose your company and its products and services to a wider market place. So the question you have to ask is what are you waiting for? It’s not about waiting until the market recovers – there is always room for spontaneity and fresh dynamic thinking. Innovation has always been welcomed in Scotland and our young minds have had a knack for creativity for centuries. We are a race of gutsy, dynamic and innovative people who gave the world the steam engine, television, radio and penicillin. Thinking outside the box is what we do. So let’s say no to doom and gloom and believe in a new generation of young creative entrepreneurs who will stimulate our economy and drag us out of this cycle of depression. Lord Mandelson announced this week that he plans to introduce heavy penalties for illegal file sharers. The consequences of downloading films or music illegally would range from the slowing down of internet connections to bans, blacklisting or fines of up to £50,000. Courts on both side of the Atlantic are ordering illegal downloaders to pay huge fines. One Boston university student was ordered to pay a total of £404,000 to record labels after being found guilty of copyright infringement on just 30 songs. And a Court in London recently ordered a woman pay damages of £6,000 after illegally downloading one computer game. It seems strange that the government would try to punish individuals for what has become a global trend. Whether it’s right or wrong, some Internet users are determined to find ways of downloading content for free. And they’ll simply change their methods to beat any new legislation. Millions of pounds are being wasted on court cases that don’t actually solve the problem. Rather than fighting against them, it’s time to look at ways of working with these pirates. Perhaps there should be an annual license fee for downloads that would allow consumers to access as many films and tracks as they like. Or maybe the model offered by Spotify is the way forward. It allows users access to hundreds of thousands of music tracks for free, much like a radio station where you pick the play list yourself. The site makes money from mini adverts that appear between songs, and by giving listeners the option to download and purchase tracks, in a “try before you buy” system. These ideas go some way to solving the problem but what’s missing is a clever business idea that keeps everyone happy, from pirates to record label executives. The company that finds a solution will be on to a winner. Some cash machines in East London are giving people the option of receiving instructions in English or Cockney rhyming slang. You also get the opportunity to review your balance on the Charlie Sheen (screen) or just take your sausage and mash (cash) and go. The operator, Bank Machine, also now intends to follow the Cockney cash machines with Brummie, Scouse and Scots versions. Skint Scots punters may have to go for skin diver (fiver) but the minted ones could probably ask for a “tenner” or a Hampden roar (score). I’ve one thing to say to Bank Machine – Gonnae no dae that!